A major part of a traditional Jewish wedding ceremony is the signing of the Ketubah. I was fortunate for this wedding event to have some say as to the best location for the consumer signing. The bridegroom wanted to have the ceremony in one of three upstairs bedrooms at the Newhall Mansion in Piru and I felt that this corner of this particular bedroom was one that provided the most interesting background and the best light based on what was available to me. When the Rabbi arrived, he took a seat to begin his paperwork and as I began to check my exposures, I realized that the Rabbi was seated in such a way as to tell a great story, even without the bride and groom being present. 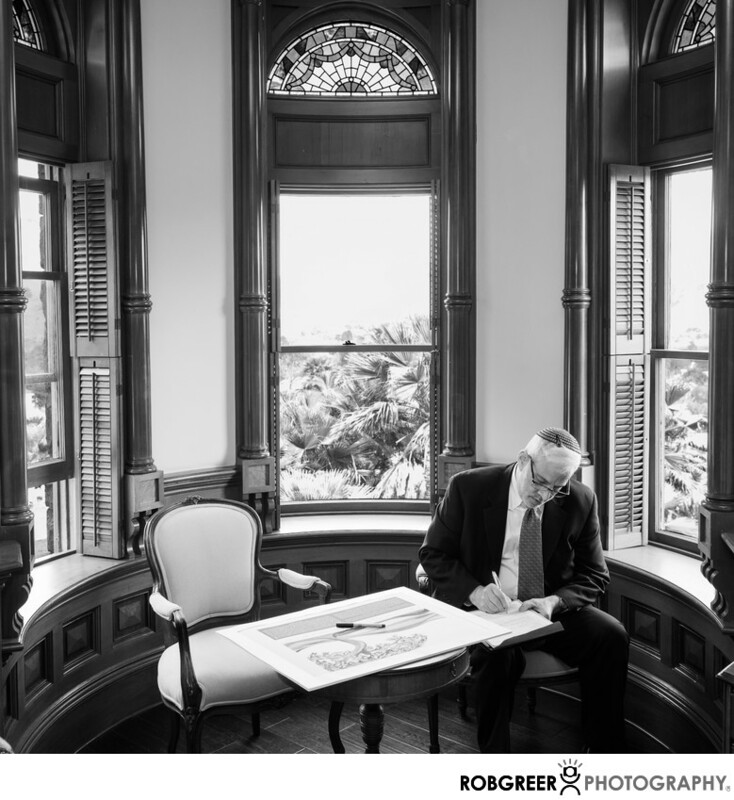 With that in mind, I frame the image in such a way as to make sure that the Rabbi's head was more or less centered in a clean area of the wall and I snapped this candid photograph moments before the Ketubah signing at this Newhall Mansion event. Location: 829 Park St, Piru, CA 93040. Keywords: Newhall Mansion (9). 1/80; f/4.5; ISO 400; 28.0 mm.